IPL has begun with a bang, getting cricket-crazy fans glued to the matches. This naturally presents brands with the perfect advertising and branding opportunities. 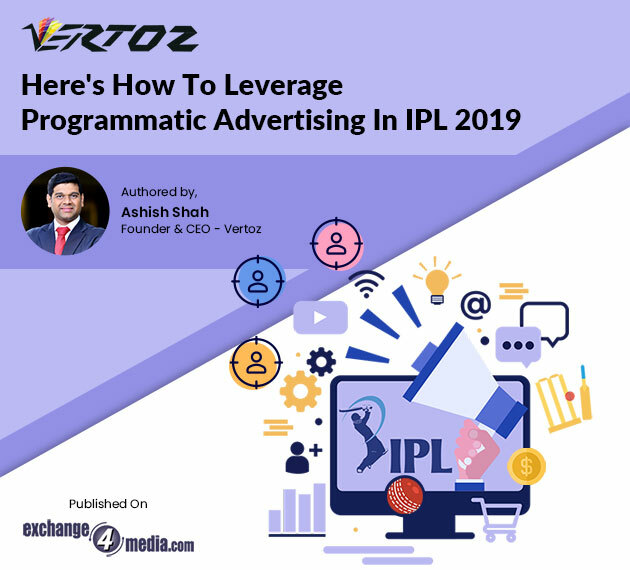 Ashish Shah, Founder & CEO, Vertoz, throws light upon how programmatic advertising is expected to have a share of around Rs 150 crore to Rs 200 crore this IPL season, in his fortnightly column, #SimplyProgrammatic, in association with AdAge India. Ashish says that it is indeed a privilege for brands to bag the sponsorship of IPL, either directly or on cricket apps, considering the limited space for sponsors. So, for brands who wish to cash-in on IPL, programmatic advertising is quite a viable option. Programmatic advertising is basically an automated approach towards traditional media buying and selling process which involves human intervention in the form of sales meetings, discussions over phone calls, and negotiating the terms and conditions. Advertisers can leverage the unique targeting capabilities of programmatic advertising to digitally target the right set of audience, instead of burning their precious ad monies on ineffective and unyielding ad impressions unlike traditional advertising methods. This increases the efficiencies and enables advertisers to channelize their budgets in a better way. Moreover, it facilitates cross-device targeting along with an omni channel approach, which allows brands to reach their TGs on multiple devices such as smartphones, tablets, laptops, and connected TVs, thereby providing a consistent brand experience across all the devices.